Now that we’ve explored the modern bottomless martini and how sensible the original drink really was, you may feel a bit of a yearning for a classic, 2 oz. 4 to 1 see-through. While I normally fill a bowl with a few mixed nuts and another with potato chips (crisps for the English speakers in the audience; and a “secret weapon” when it comes to pleasing grown-ups), a special night calls for something a bit more. If you haven’t found a great oven to table baking dish, I recommend Le Cruset, a copper one or one of the nifty porcelain ones (like mine pictured above found at TJ Maxx.) It makes preparation and serving that much simpler. Spray the baking dish with olive oil cooking spray or dribble a bit of the oil onto the dish and spread it about to ensure that the puff pastry doesn’t stick. If using the puff pastry, roll it out onto a lightly floured surface and form into a square with pinched edged. 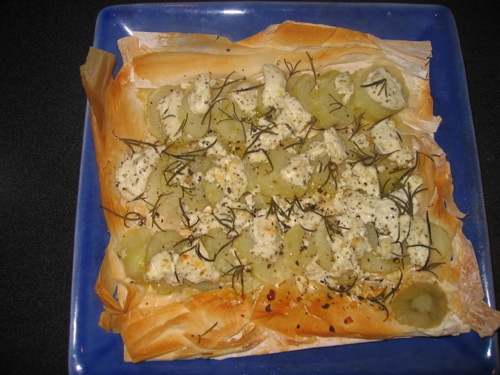 if using the phyllo, lay a few sheets into the bed of the baking dish and lightly spray with the olive oil spray. Bake at 400ºF for 10-12 minutes until the cheese melts and the edges of the pastry are well-browned. Slice and serve. Goes very well with a Hendricks gin based martini. This entry was posted in Entertaining and tagged appetizers, goat cheese, hors d'oeuvres, martinis, recipes. Bookmark the permalink. i hope you’re not calling mrs. e. at tart! i just got the greatest little mandoline. now i can make my own crisps out of anything, especially potatos and apples. Now Fairfax, you know me better than that! I’ve got a couple of mandolines from The Dehilleran in Paris, but I wind up chopping up my fingers using them. What do you use to hold the vegetables? I can’t quite figure out the mandoline either. I’m fairly deft with a good chef’s knife – so it’s not usually too much of a worry. Still, I’m eager to take a knife skills class at the local Whole Foods – one can never be too precise with juliennes and dicing! Yummy looking post, as usual. I must admit, when I read the title to this post, I did not think it involved a recipe. Dinner tonight, we shall start with this tart and a drink. Yum! Must make this very soon! Thank you for the recipe! Had to read through many entries before coming upon a misspelled word, which is a testament to your attention to the importance of all things worth transcribing- advise your readers to seek out Le Creuset, not “Cruset” as you suggested.